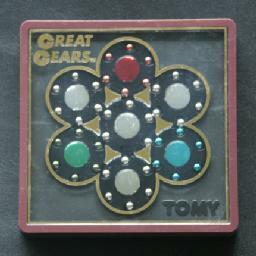 Great Gears is a beautiful and tricky puzzle manufactured by Tomy. It consists of 7 disks in a hexagonal arrangement, one in the centre with 6 disks of the same size around it. Every disk has 6 pockets on its edge. Each pocket contains a ball bearing, except for exactly one pocket which is empty. The top disk is red, and the six ball bearings that are coloured red belong on that disk. Similarly there are 6 blue balls that belong in the blue disk at the bottom right, and 6 green balls belonging in the green disk at the bottom left. The 23 remaining bearings and 4 remaining disks are not coloured. There is a wheel on the side of the puzzle. Turning the wheel in one direction will turn all the coloured disks and the centre in the same direction, and the other disks in the opposite direction. When the disks are rotated so that the empty pocket is at a point where two disks touch, then the ball in the adjacent disk can be moved over to the empty pocket by tilting the puzzle. The fact that the disks cannot be controlled individually makes it a remarkably frustrating puzzle to solve. You will often find that the last ball of a particular colour is hard to solve because the gap, the coloured ball and the pocket where it belongs don't line up. As soon as you manage to empty the pocket, it will not line up to the coloured ball in the adjacent disk. The puzzle was patented by Koichi Minami and Tohru Nishimiya on 28 August 1984, US 4,468,033. There are 6·7=42 pieces (including the gap), consisting of 6 red, 6 blue, 6 green, 23 silver, and one gap. This allows for 42!/(23!·6!3) = 145,608,355,684,298,707,200 = 1.46·1020 positions. Number the disks 1-6 clockwise from the top, and the centre disk is 7. The red, blue, and green disks are then 1, 3 and 5 respectively. A move is the transfer of a ball from one disk to another. Turning the disks will not be considered a separate move. Each time a ball is transferred, the gap moves in the opposite direction. Any move sequence can be succinctly described by listing the disks that the gap visits. Let's consider just three mutually adjacent disks for now, disks 1, 2 and 7. The gap is in disk 7. You can move the gap around these disks, visiting disks 1, 2, 7, 1, 2, 7 etc. in turn. The balls move in the opposite direction from the gap, and eventually (after 17 moves) all the balls from disk 2 will have moved to disk 1, those from disk 7 move to disk 2 and the balls from 1 move to 7. This useful sequence will be used several times in the solution to move one ball (or all balls) from one disk to another. The solution described below takes a very large number of moves, but at least it is easy to understand as it conceptually easy and has no move sequences to remember. Phase 1: Solve the red disk, disk 1. Find a red ball that is not yet in disk 1. Move the red ball over to disk 6 using the sequence explained above. Rotate the disks until the red ball touches disk 1. If the pocket the red ball is lined up with contains another red ball, then move the red ball from disk 6 once around disk 5, 7 and back to 6 (or in the opposite direction 7,5,6), and try steps c-d again. You now have the red ball in disk 6 lined up with its pocket in disk 1. Bring the gap to disk 7. See which pocket in disk 1 the gap lines up with. If this is not the same pocket as your red ball, then do moves 5,4,7 and repeat this step. Do moves 1,6 to insert the red ball into its pocket. Repeat a-g, until all red balls are solved. Phase 2: Put all the green balls in disk 6. This is essentially the same as the previous phase. Note that the green balls will be put in the correct disk later in phase 4 - we put them in disk 6 for now to keep more room to manoeuvre later on. Find a green ball that is not yet in disk 6. Move the green ball over to disk 5. Rotate the disks until the green ball touches disk 6. If the pocket the green ball is lined up with contains another green ball, then move the green ball from disk 5 once around disk 4, 7 and back to 5 (or in the opposite direction 7,4,5), and try steps c-d again. You now have the green ball in disk 5 lined up with its pocket in disk 6. Bring the gap to disk 7. See which pocket in disk 6 the gap lines up with. If this is not the same pocket as your green ball, then do moves 4,3,7 and repeat this step. Do moves 6,5 to insert the green ball into its pocket. Repeat a-g, until all green balls are in disk 6. Phase 3: Put all the blue balls in disk 2. This is again the same as technique the previous phases. Note that the blue balls will be put in the correct disk later in phase 4. Find a blue ball that is not yet in disk 2. Move the blue ball over to disk 3. Rotate the disks until the blue ball touches disk 2. If the pocket the blue ball is lined up with contains another blue ball, then move the blue ball from disk 3 once around disk 4, 7 and back to 3 (or in the opposite direction 7,4,3), and try steps c-d again. You now have the blue ball in disk 3 lined up with its pocket in disk 2. Bring the gap to disk 7. See which pocket in disk 2 the gap lines up with. If this is not the same pocket as your blue ball, then do moves 4,3,7 and repeat this step. Do moves 2,3 to insert the blue ball into its pocket. Repeat a-g, until all blue balls are in disk 2. Phase 4:Put the blue and green balls in the correct disks. Do moves 7,5,6 six times to move the green balls from disk 6 to disk 5. Do moves 7,3,2 six times to move the blue balls from disk 2 to disk 3.